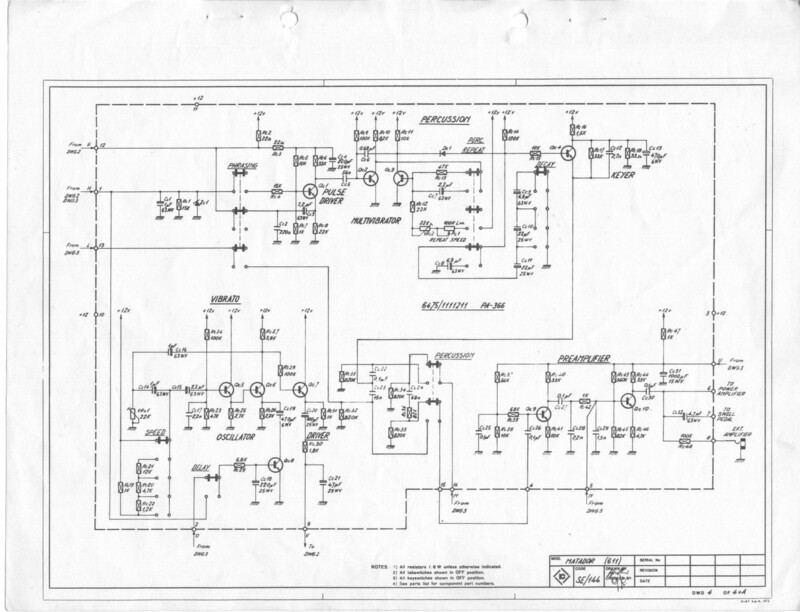 As an Engineer, I’m amazed when I look at schematics like this. These days, no one in the world would design tone generators like these. They all work independently, with no crystal reference. The design depends entirely on the precision of the components in order to keep things in tune. Thanks for posting this – it’s a real work of art. I remember opening one up for the first time and looking at the mass of cables and wires thinking what the heck is all this??!!!?!? 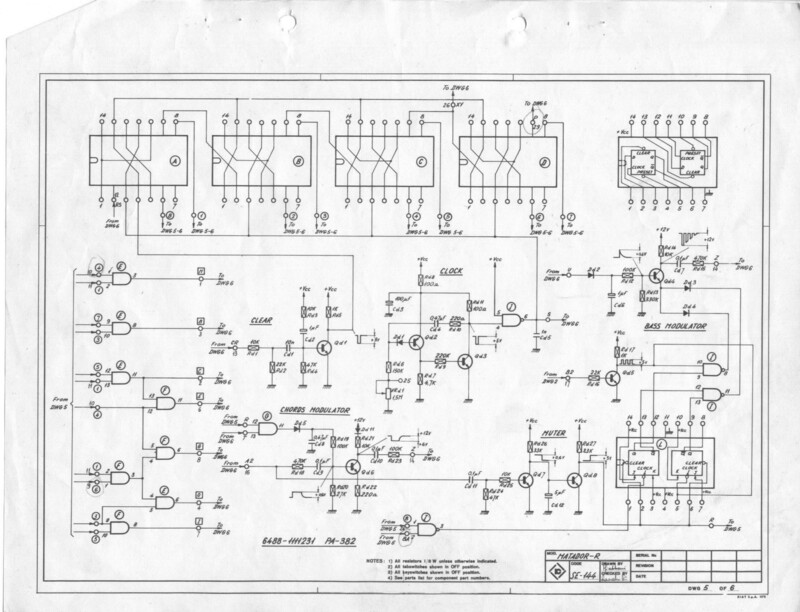 I need an Schematic Diagrams for Farfisa tr-80 aplifier. HI!!! I own the Farfisa Matador – R ! 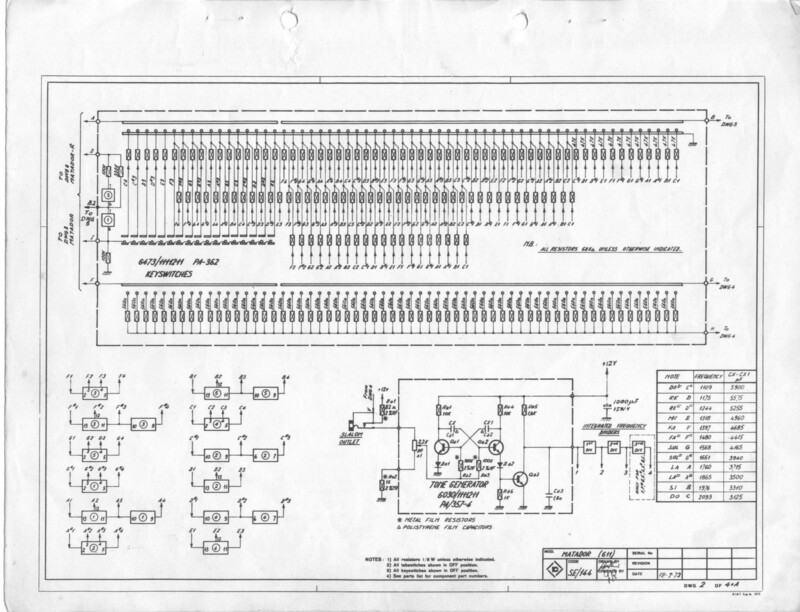 You helped me alot with those schematics! One note was playing incorectly. I foud out that the problem was in the frequency devider chip. Now they are playing like new! thank you so much for posting this and making it available. I’m trying to convert the power from German to NA on this Matador I picked up last year. This schematic will be very helpful! No problem. If you succeed, please come back and share your process so you can help others! I got a Farfisa Matador as a present, but the A flat key doesn’t work in any octave. I have no experience in fixing things, does anybody know how I could make it work again? The oscillator is out. Find a repair guy to fix it for you. I’ve got a matador which I love. one of My favorite parts is when I play two or three note chords the crazy sounds it produced. The reason why I am posting though is that my friend, who was using at the gig, didn’t tighten up his keyboard stand and when he placed it on top my matador crashed to the floor. Now, none of the keys work and I miss hearing it. I see the first poster,gary, is from Raleigh. Well I live in Richmond. Would you try and fix it if I drive it down to you? Does anyone know a repair person that will work on farfisas in the mid Atlantic region? Does my problem sound like the kind of thing that’s going to cost a ton if money? P.S. : That farfisa matador is great!! 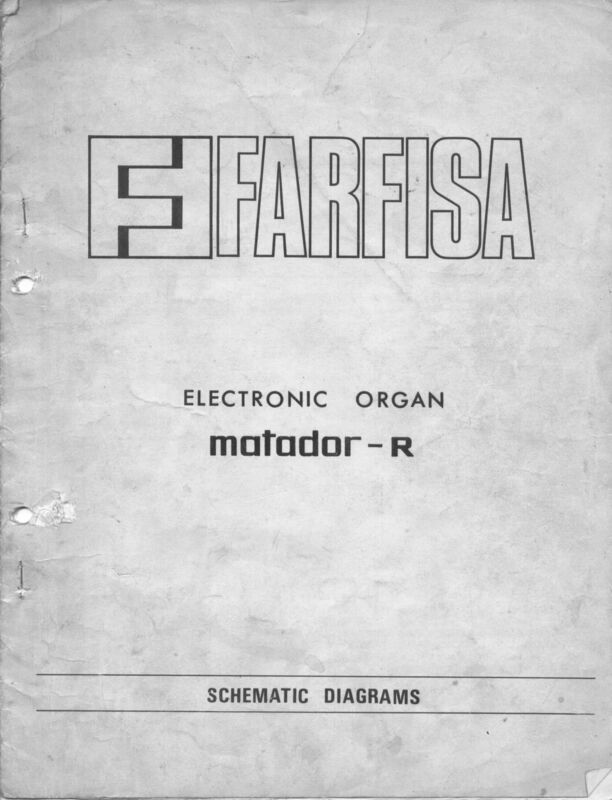 I own Farfissa 110 Professional organs and I need schematics for them? Don’t You accidentally know where I can find it? Thanks for all Your help in advance!! 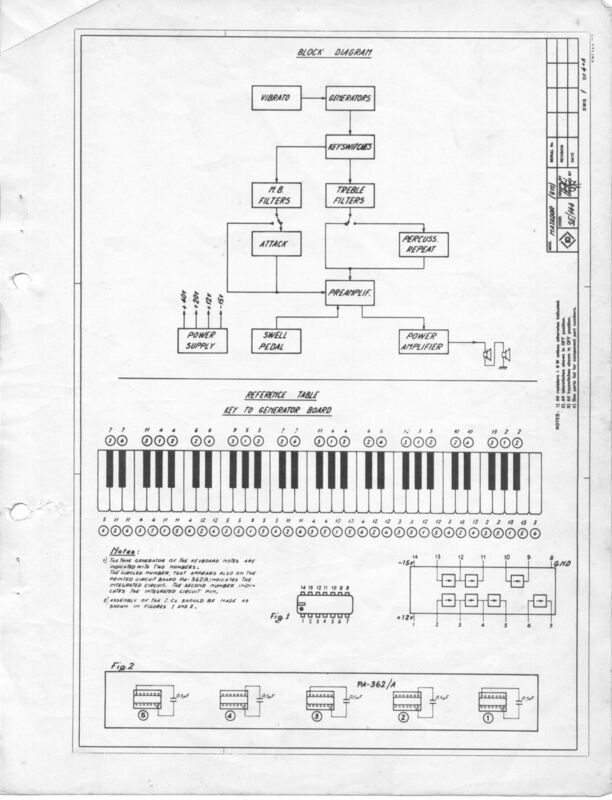 I have the schematics for the Deluxe, and the Duo here: http://farfisa.org/category/schematics/ If you have the grey switchable octave, you may have a Deluxe. I have a Farfisa matador-R and I have a problem with the octave range in the lowest 17 notes (lowest tenth). It sounds one octave too high.When the bass-sound is ON, it too sounds one octave too high. Only when the automat is ON it works OK. All connecors have been cleaned and I have all schematics. What can be wrong? Thank you for the schema of Farfisa Matador. Have you the schema of cablage and the plan of implentation of the components? Sorry, that’s all I have my Swiss friend. Good Luck! Tengo un Farfisa 251. En este momento está dañado y no lo puedo usar. Desearía tener el diagrama electrónico para poder arreglarlo. Muchas gracias. I Have a Farfisa Organ, model 251. 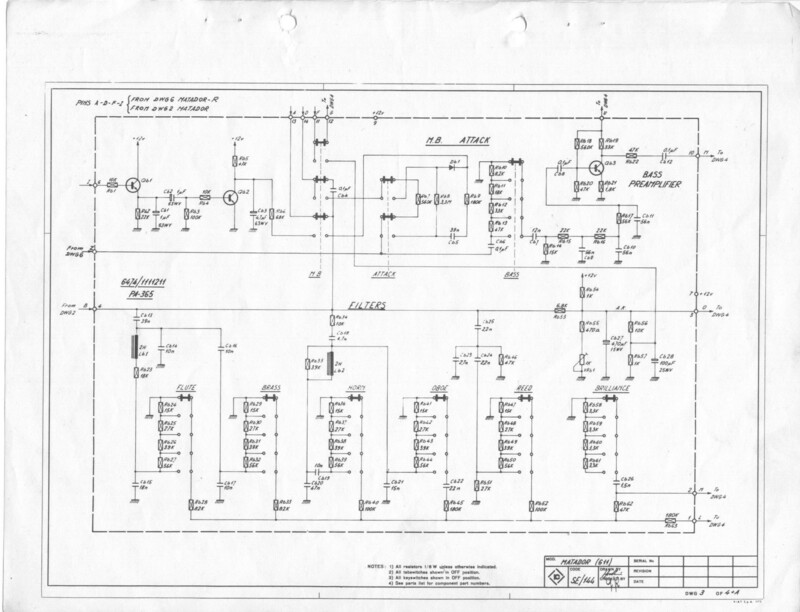 I need the schematic diagrams for repair. Thanks. plus de son, à part la boite à rythme et un joli “ploc, ploc”, à chaque appuie de touche. sans doute l’oscillateur, mais sans schéma, c’est moins simple à réparer. hi! i own a Farfisa Matador 80.. do you have any info about this organ? 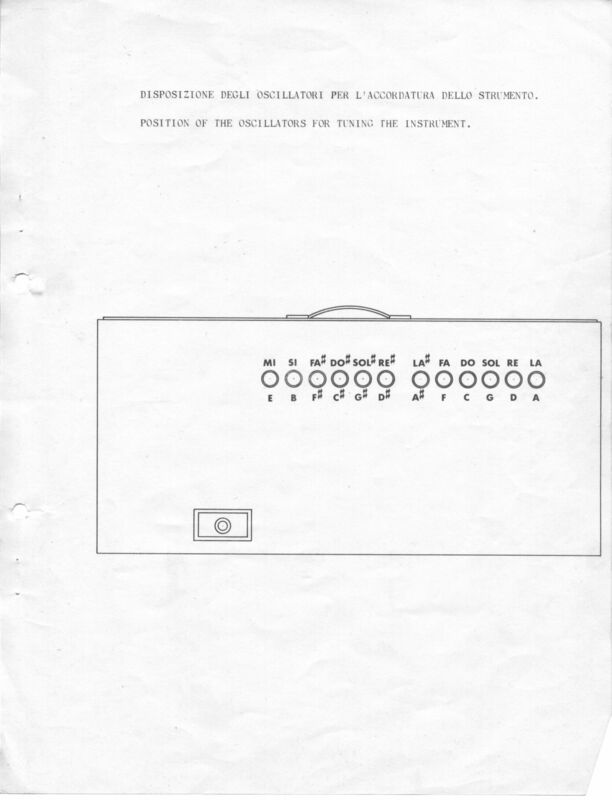 i haven´t found much on-line.. like Schematic Diagrams for amplifier,fabrication year, value, anything you have..
i own a Farfisa italy model numéro 6448 // 404 and search Schematics for the one. 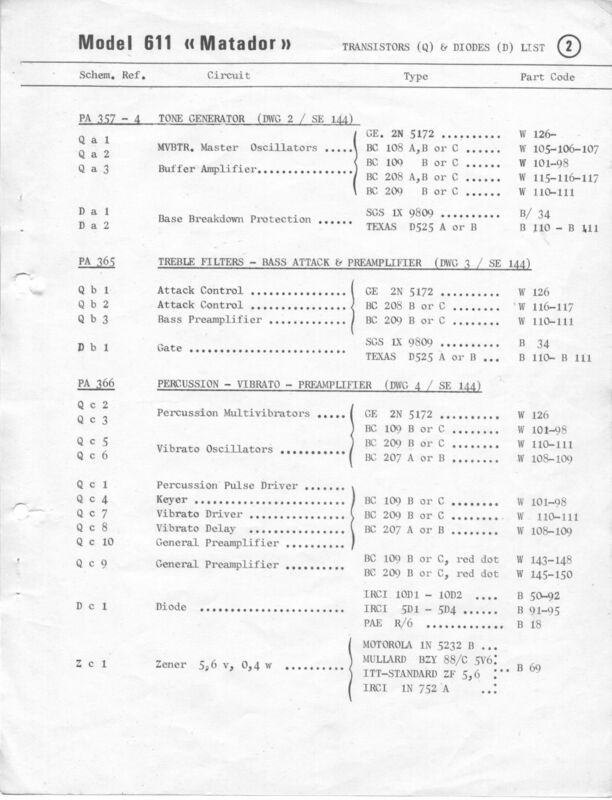 and search Schematics for the one. The bulb is burnt out in my volume pedal. I have been having a terrible time finding a replacement, especially since my old bulb was unfortunately thrown away. Any suggestions as to what the bulb type is and where a replacement can be found? The bulb from a Morely pedal looks similar, but I don’t know if it’s it. The Bulb from those old Morley pedals are similar. Same for the knee booster of the compact series. 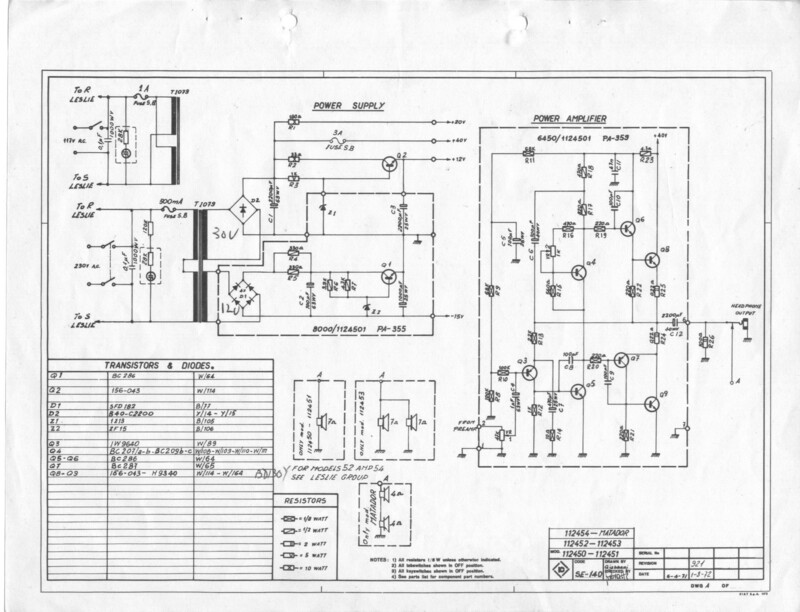 Take a look at some of the schematics we have on the site for the Compact line and you’ll find your answers in there. I have bought them from Radio Shack. You are AWESOME ! 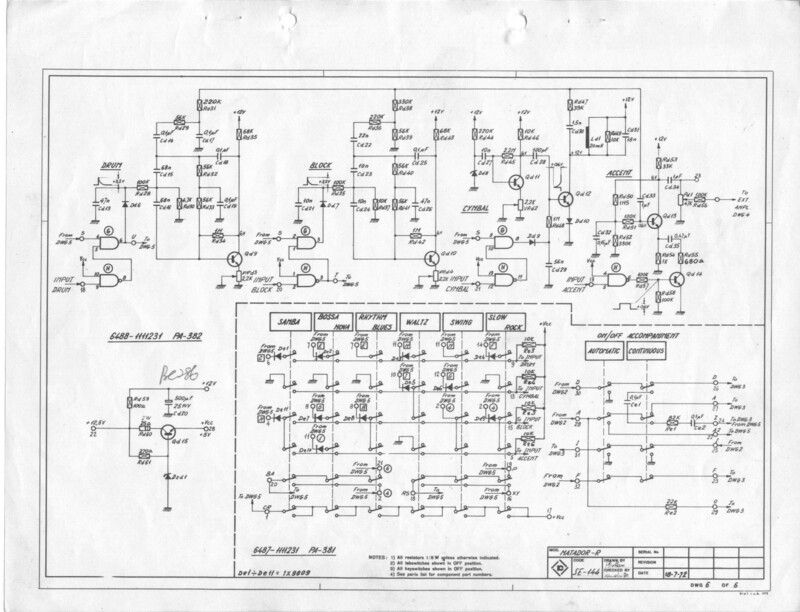 Thank you for sharing the schematics !! Finally I could repair an awesome Farfisa Matador of a friend of mine. There’s a link to this page as well (tell me if you don’t agree). Bye ! I think to try this by micro controller. But you did without any micro controller. why? but now can I success if try with micro controller? There is someone on the combo organ list (Yahoo groups) who has a problem with his Matador. I have posted the link to your drawings to him. I am sure you will make him very happy. J’ai récupérer un MATADOR R, malheuresement je ne trouve nulle part de schéma de cablage et cet appareil a été bricolé et certains fils sont désoudés. Quelqu’un a t-il le schéma de cablage ? Merci infiniment à celui qui pourra m’aider. La partie ampli fonctionne parfaitement mais en amont je suis perdu. 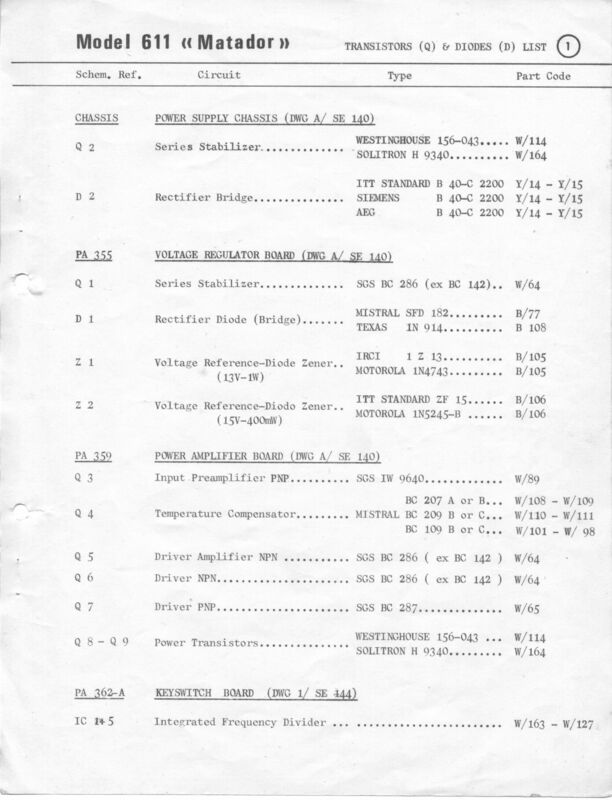 I need the matador wah wah schematics board. Anyone who helps? Unfortunately, I got an inoperative Farfisa Professional 110 organ. There is no visible flaw, but it sounds I can not elicit. Could someone send him a diagram to master a musical instrument repair to get started. Hi! 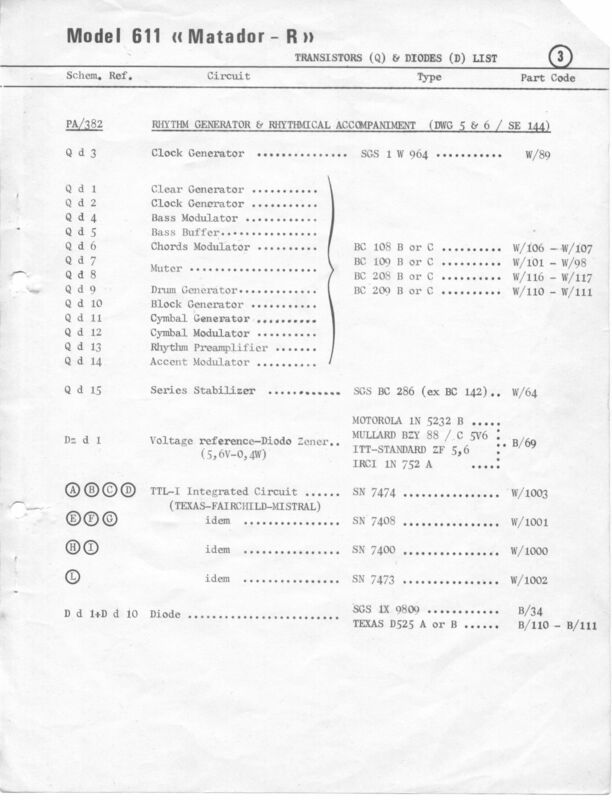 I need the Farfisa Matador 80 schematics. Anyone knows where can I get it?